A little less than two months after firing abusive men’s basketball coach Mike Rice, Rutgers’ athletic department once again finds itself having to do a public relations shuffle with news that its brand new, reform-minded athletic director may have abusively berated members of the University of Tennessee’s women’s volleyball team she coached 16 years ago. Julie Hermann, former coach of the Lady Vols volleyball team and former assistant to the athletic director at Louisville, was introduced as Rutgers’ new athletic director a mere 11 days ago. Although the school described Hermann’s appointment as a way to move forward from the whirlwind of psychic terror that was former men’s basketball coach Mike Rice, social media wasted no time unearthing some of Hermann’s own past transgressions. According to the Newark Star-Ledger, Hermann’s appointment “quickly spawned” a Facebook conversation among at least 17 of Hermann’s former Tennessee players about the verbal abuse they suffered throughout five of the six seasons Hermann coached at the SEC athletic powerhouse. According to the former players, after Hermann read the letter, she told her team bluntly, “I choose not to coach you guys,” and then left the room. 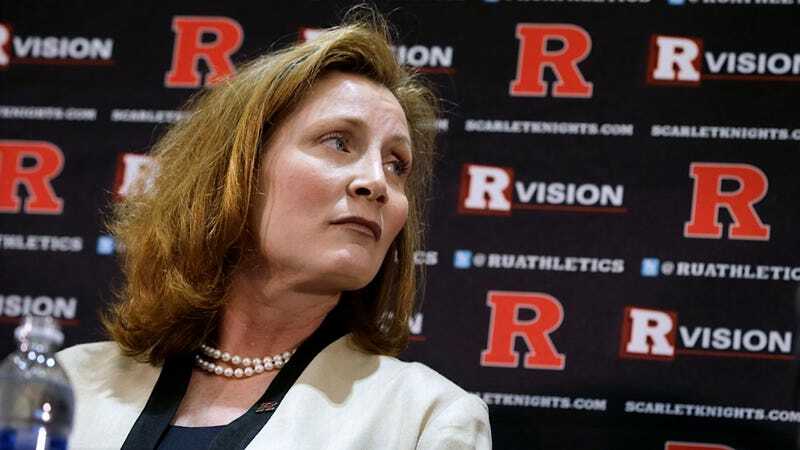 Hermann’s leadership abilities have been praised by two of her former bosses at Tennessee and Louisville, and Rutgers’ president Robert Barchi has said that Hermann (who will be paid an annual salary of $450,000) is exactly the sort of athletic director who can lead Rutgers out of the maelstrom of controversy that Mike Rice steered the school into. There’s a lot at stake: Rutgers is making a lucrative leap to the Big Ten, and wants to distance itself from the Rice controversy as quickly and seamlessly as possible. That might be hard to do, especially considering the fact that these latest allegations of abuse from former Tennessee players follow reports of another controversy Hermann was involved in while coaching at Tennessee. She has already faced press conference scrutiny over a 1997 jury verdict that awarded $150,000 to a former assistant coach who said Hermann fired her because she became pregnant. For her part, Hermann says she worried at the time that a baby would interfere with the assistant’s job, and that the assistant was really fired because she was underperforming. Hermann also denied allegations of abuse from the 11 players who decided to go on the record for the Star-Ledger, citing specifically the allegation that she ever called any of her players “whore,” saying that the word is “not part of my vernacular. Not then, not now, not ever."